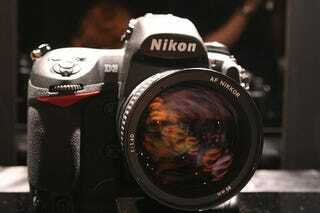 The D3, that enormous full-frame camera from Nikon, has had its first in-depth review. PhotographyBLOG's Gavin Stoker gave the $5,000 machine five out of five for features and image quality, while design, ease-of-use and VFM got 4.5 out of 5. Choice quotes after the jump. I haven't been so impressed with a set of images since trialing Fuji's S5 Pro, itself boasting Nikon heritage. For the purposes of the images displayed here I was shooting large size, fine quality JPEGs. The Nikon D3's images have a smooth, film-like quality to them, with colours realistically and accurately rendered - primary colours in particular delivering plenty of punch. If we're picking holes, there is some pixel fringing visible on very close inspection, a slight fish eye effect at maximum wideangle, some shading and loss of sharpness toward the edges of the frame using the supplied lens, but in truth neither mars an image - especially one that's likely to end up in the forgiving media of print. The Nikon D3 has got to be the top choice for anyone wanting high quality, rapid-fire image capture, or extremely low light photography without flash, who is not otherwise wedded to the Canon system. With a D3 you get a camera with the best bits of its D2Xs and D2H predecessors without having to buy both. That said, the DSLR's heft with lens attached means that it's not the one you'll want to be lugging around with you all day firing off holiday snaps, the D300 a sensible alternative if you don't feel the need for speed or (obviously) full frame capture. But the fact that the Nikon D3 is (currently) pretty much peerless means this is a rare occasion of a camera deserving the full compliment of review stars.